Google “What CBD Can Do” and you will find thousands of results. I was frustrated with the progression of my father’s Lewy Body Dementia, and through researching natural cures I discovered CBD. My journey to find the best Hemp CBD for him lead me to this brand. The results have been absolutely amazing, and an added bonus is that it also helped relieve my back pain and my migraines — I was able to transition off of my pain medicine! 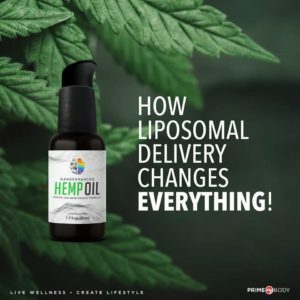 Why is this (PMB) Nano-Enhanced Liposomal Hemp Oil hands-down the best hemp oil on the planet? The answer, in a nutshell, is the world-renowned chemist, Dr. Christopher Shade. Unlike other hemp oils that sit in carrier oils, this one doesn’t use a carrier oil. It is the only oral delivery comparable to intravenous efficacy. Dr. Shade developed a method to sky-rocket the absorption of nutrients into your cells. This absorption is also called bio-availability, which means your cells will get the full benefit of the hemp plants’ phytocannabinoid diols, including cannabidiol. FYI: Cannabidoil is better known as CBD. It is one of the primary phytocannabinoids in our hemp oil. Because at the end of the day, it doesn’t really matter how much hemp oil you take — what matters is how much actually gets into your cells (how much your body absorbs). Dr. Shade holds a world-wide patent on this amazing delivery method. Dr. Shade is not only a chemist; for many years, he was a dedicated bio-dynamic organic farmer. He is dedicated, as a farmer and chemist, to producing the cleanest and purest ingredients possible. No synthetic products or solvents are ever used, and this hemp is 100% organic. Contact me today if you would like more information — we are also looking for more distributors due to the growing demand for this product.